Beekeeping is a satisfying and practical contribution to the environment. With so many ways to get involved, it’s no wonder people are becoming enthused. Sometimes circumstances provide the bees and you simply have to dive in. If possible, however, take time to research beekeeping methods and learn the basics before investing in a beehive, tools and gear. You’ll want to consider which bees to choose, where the bees will be located, health and safety, your legal requirements, how much time you have, and what it means to be a responsible beekeeper. An inevitable part of keeping European honey bees is occasionally getting stung. The normal reaction to a bee sting varies, but might involve itchiness and irritation for a few days and localised swelling. A severe allergic reaction is life threatening, so if someone in your family is allergic to bees, think seriously before deciding to install them on the property. Speak to your medical professional for advice specifically for your situation and err on the side of caution. It’s important to run beekeeping plans past the immediate neighbours for similar health reasons. In addition, beehives should not be positioned in the front yard if possible, or located close to schools, childcare centres, hospitals or other public facilities. The first time you open a beehive is a profound experience. Over time any wariness turns to fascination and confidence. The occasional person, however, finds that honey bees genuinely frighten them and this becomes a hurdle to checking beehives regularly. Beekeeping should be enjoyable and does involve handling bees, wearing protective clothing and using special equipment, so spend time with bees first to make certain they and beekeeping are for you. To feed themselves and their brood, bees need a range of nectar and pollen sources in a 3km radius from the hive, available for as much of the year as possible. If you live in an Australian town or city, count yourself lucky: there are sufficient parks and gardens with such a wide variety of flowering plants that bees should have little trouble finding food. If you are in the bush, you might have to consider planting a bee-friendly garden (see chapter 5, Planting to Nourish Bees, pages 60–65), and getting bees once it is established. Alternatively it may be necessary to move the bees seasonally to access flowering trees and crops so they have sufficient nectar and pollen. This is known as migratory beekeeping and is commonly practised by professional beekeepers. Before you embark on a beekeeping career, consider whether you have a suitable spot for a beehive in your backyard. Bees can be flexible, so use your imagination. Hives have been sited in chook runs and even on balconies with great success. If bees are kept on top of the Paris Opera, why not consider your own rooftop? The advantage is that bees maintain altitude when they leave the hive to travel to a nectar source, so will not be a bother to anyone below. The rooftop must be strong enough to support a heavy beehive, say 75kg, plus the owner. To make a rooftop suitably cool and protected for the comfort of the bees it may be necessary to install screens, planter boxes or even fake turf. There must be safe access for the beekeeper and a sensible way to get equipment up and honey back down. A ladder might sound nifty, but envision yourself on it carrying a heavy box of frames with some grumpy bees on your tail. Stairs are a much better idea for safe access. Rooftops can also be very hot, especially for someone who is removing honey while wearing a protective suit. Find even more suggestions for where to keep your hive in The Contented Bee. Installing a honey bee hive on your block and leaving it to manage itself sounds closest to nature’s way, however best practice beekeeping involves regularly monitoring the bees. Like most food-producing livestock, honey bees require a degree of maintenance to remain healthy. The hive should be checked regularly in spring and summer for signs of swarming, and in summer and autumn for surplus honey so bees don’t run out of room. The hive will need to be packed down in autumn and the bees’ food stores ascertained so the bees remain healthy over winter. Beehives and associated gear need to be kept clean and in good condition. Arguably most important is the regular monitoring of beehives for health issues. 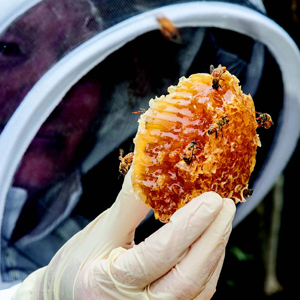 Although Australia has so far escaped the dreaded Varroa mite, our bees are subject to diseases, pests and parasites. Because bees are social and interact with wild bees and those from other hives, if diseases are not discovered and dealt with quickly and appropriately, they can spread to other bee colonies in the area with disastrous consequences for bees, beekeepers and ultimately our environment. Responsible beekeeping means keeping healthy, disease-free hives. 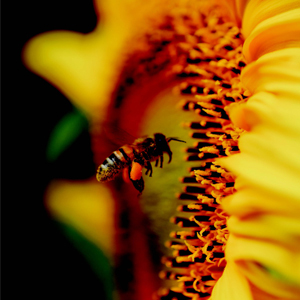 Bees are really very low-maintenance, but you do need to factor in time for routine check-ups. There are many different possibilities when it comes to keeping bees. Keeping your own hive in your own garden is just one. If the backyard is unsuitable, why not keep them elsewhere? You could purchase a hive together with another interested beekeeper, share the duties and locate the bees at their place. Alternatively, install your bees at the home of someone who’d love increased pollination and some gifted honey, but doesn’t want the responsibility of looking after bees. If that’s the case, nut out any future issues beforehand, and flag that you will need to access the bees regularly, especially in spring. Equally, you may have the ideal garden setup for some bees, but be unable to commit the time to them. In that case, you could host bees for another beekeeper. Contact a local beekeeping group to see if there are bees looking for a home. If honey bees aren’t possible for you, there are many satisfying ways to help our native bee species, whether by keeping native stingless bees, providing habitat for solitary native bees, or planting to provide food for all kinds of bees in your garden. Let’s all embrace the initiatives that help bees, such as avoiding the use of herbicides and insecticides in the garden and on the farm, and planting a range of bee-friendly _ owering plants to create a bee garden. Bees need access to water, so maintaining a saucer of water with safe places to land such as pebbles or twigs, or a saucer of wet sand will be much appreciated. Support local beekeepers and buy your honey from farmers’ markets. And as a bee warrior, share with others why you are passionate about bees and want to help them! All the buzz on keeping backyard bees – an informative and inspirational handbook full of advice, experience and stories from experts and enthusiasts. With bees worldwide in deadly peril, Australians are keen to lend a helping hand. Keeping a hive or three has become a popular lifestyle trend – and it’s more achievable than you might think. 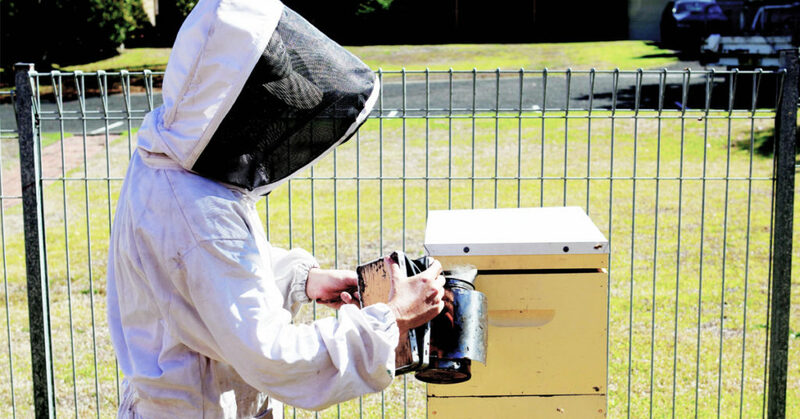 Whether you’re in the inner city, suburbs or on acreage, keeping bees can be easy, low-fuss and fun for the whole family to get involved in – imagine bottling your very own honey! This lively guide features inspirational experiences and gorgeous photos from scores of enthusiasts across Australia who have sweetened their lives by keeping bees. Practical chapters by a range of experts give the low-down on getting started, caring for your bees, harvesting your honey and wax (with recipes), troubleshooting, what to plant to help out your little workers, and great information on the popular option of keeping native stingless bees. 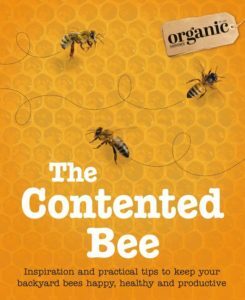 The Contented Bee will inspire you to help out the bees – and enrich your own life, too! This entry was posted in ABC Books, Gardening, How to and tagged beekeeper, Beekeeping, Bees, Hive, Honey, Organic Gardener, Organic Gardener Magazine, The Contented Bee. Bookmark the permalink. « Your chance to WIN the ultimate Veronica Roth prize pack! "So you want to be a beekeeper?"